A. 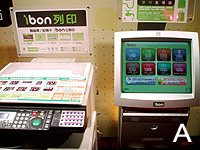 "ibon" is hooked up to multi-functional devices. It can also transfer information from Bluetooth, USB and memory cards to the Net, acting as a personal work studio. B. "ibon" currently provides a number of services: office-related work, bill payment, insurance fees, travel, ticket booking and getting information.